If you have any questions or comments on any of the picks I made, leave a comment on this entry and I’ll reply to you. I have to blog about it, I’m sorry. According to a report in the NY Daily News, Yankees 2B Robinson Cano said that he would like Pedro to come to the Yankees. Pedro has consistently said that he wants to pitch in 2010, and has made it clear that he wants it to be for the Phillies. When asked about the Yankees, he kind of dodged the question. We have to do it, lets take a look. He’s led the league in ERA five times. He has a 2.93 career ERA. He has led the league in strikeouts three times. He has led the league in WHIP six times. He is a three time Cy Young winner. He has led the league in H/9 and SO/9 five times. He has led the league in SO/BB four times. Chuck, Chuck, Chuck, Chuck, Chuck!!!!!!! Im, sorry, but Cano should have kept his mouth shut to begin with. Nobody talked about him on the Yankees until now. Yes, the Yankees now realize they have a chance to sign one of the best pitchers in the history of the game, but I don’t listen to the kind of junk he says on a daily basis for ANYBODY. Plus, I don’t want to give up the “who’s your daddy,” even if it is for just one game a year. And the Yankees are World Champions! 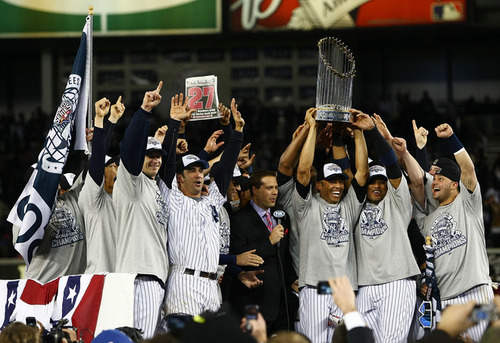 ’09 Yanks nab 27th World Championship. 327 days and 28 million seconds later, the Yankees passed around their 27th World Series trophy, for the first time in nine years. From CC’s horrible start on opening day, to A-Rod’s walk off in the fifteenth inning against the Red Sox, the Yankees have climbed every mountain, jumped every hurdle and now stand atop every team in Major League Baseball. In his potential final game as a Yankee, Hideki Matsui tied a World Series record with six RBI’s in a game, sealing up his World Series MVP honors. championship and is now the true champion that we all know him to be. Andy Pettitte stepped up big for the Yankees on three days rest, and in possibly his final game in pinstripes, helped get his sixth ring. 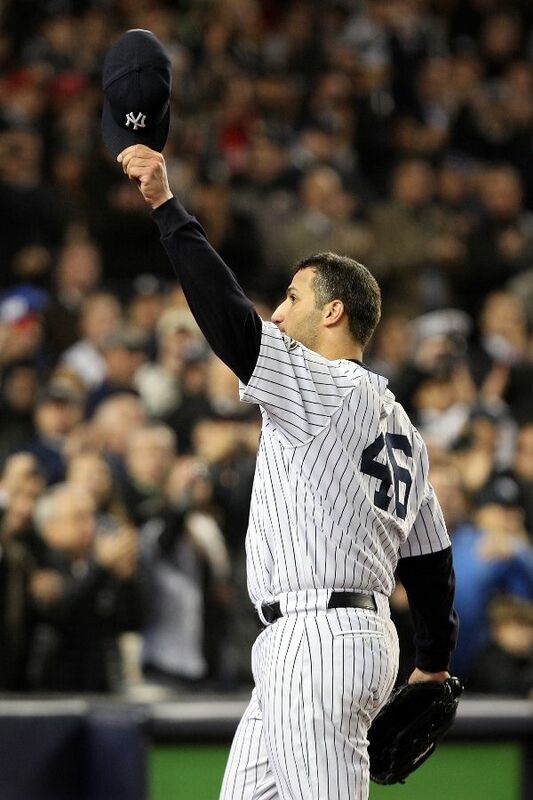 As Andy Pettitte walked off the mound in World Series game 6, the crowd serenaded him with epic cheers, showing their appreciation for this mans determination and dedication for the past 15 seasons. The 37 year old took a seat in the dugout, with the anticipation of his careers end in near sight. In his final start of the ’09 season, he pitched 5.2 innings of 3 run, 5 hit ball, walking 5 and striking out 3. In his long passionate career with the Yankees, the two time all-star won 192 games, struck out 148 batters and won 5 championships, with number 6 in his near hopes. Not to say Pettitte couldn’t resign next year, in fact, there is a good chance he will. But, if today was his final start, I would like share my, along with this entire cities appreciaition for everything he has accomplished on this team. Thank you, Andy Pettitte. Best closer of all time may go for three. If there is a recurring theme in this series, it’s the inability for either team to put it away. Up and down each of these teams, there have been holes in this series. It’s fair to say that whoever manages to plug those holes up, will win the series. It’s also fair to say that the Yankees have the clear advantage regardless of anything else. There at home where they had more success than any team in baseball, and, they have control over the only sure thing left in this series: Mariano Rivera. So, we are left with yet another issue. How do you use the one sure thing left in the series to win the series. With a lead in the latter part of the game, Rivera is a sure go. Whether that situation will present itself is yet to be seen. But, assuming it does, I think it is fair to say that the Yankees will, under no circumstances, watch a late inning lead get blown with Rivera sitting out in the bullpen. In the seventh inning tonight, the stage will be set. With a two or one Yankee lead, the decision will begin to mount upon Girardi’s shoulders. Do you give the ball to the greatest reliever of all time and say, “bring us home”? Or do you play the safe route, and ensure yourself that you will have him in game 7? The last time Rivera pitched more than two innings in a postseason game was just a few weeks ago. Rivera pitched 2.1 innings against the Angels and gave up no runs and one hit in game 2 of the ALCS. He has pitched three innings in a postseason game twice, the last coming in 2003 against the Red Sox, another scoreless performance. So, you can ensure the champagne, or you can ensure that you will have Rivera for as long as you want in a potential game 7. But, the decision won’t be made by us. Here is a recent update from Yankee reporter @BryanHoch via Twitter.com: “Joe Girardi believes the Yankees have Mariano Rivera for at least two innings tonight — “Maybe a litter more,” he said. 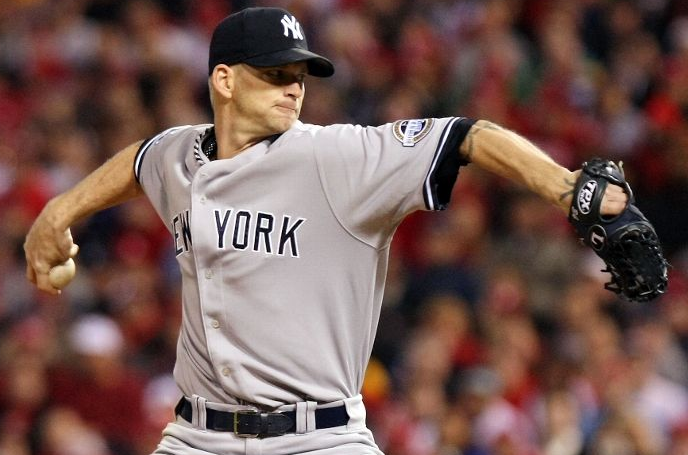 Pettitte to start game 6 on 3 days rest. Andy Pettitte gets the nod tomorrow in game 6 and will be pitching on 3 days rest for the first time since 2006. That starts the debate. We started hearing about it yesterday, and we haven’t stopped hearing about it since: The ineffectiveness of starters on 3 days rest. Starters in the World Series on 3 days rest are 12-36 in the last 48 decisions. I’ve been watching Mike Francesa a lot today, and he has brought up that number about 50 times. Here’s my counter. In 2009, starters have a lower ERA on 3 days rest then on 4 days, 5 days and 6 days rest. In the last 10 World Series starts on 3 days rest, 6 of them have been quality starts, including 6 starts with less than 2 runs allowed, a complete game, an average of 6.1 innings pitched per start, and an ERA 3.73. Those numbers are not to bad at all. So, you can go with the recent history or you can go with the information used by the critics that dates back to the 80’s when the game was completely different. Not to mention that of the last 10 World Series starts on 3 days rest, two of them were tomorrows starter, Andy Pettitte. In those 2 starts, he pitched 17 innings and gave up ZERO runs. So, all of the sudden, the stats are completely in Petttittes favor tomorrow. But, of course, Mike Francesa had a counter argument for that. He pointed out that both of those Pettitte starts were a long time ago, 6 and 13 years respectively. Mike said that Andy is an older man now and is not the same pitcher. Okay, so lets look at the older pitchers on 3 days rest. 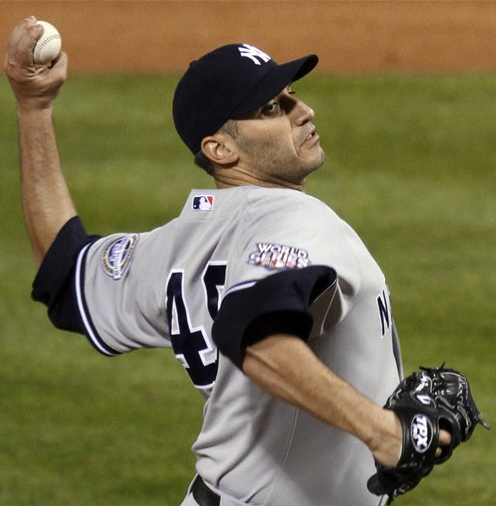 Lets look at pitchers of the same age as Pettitte (37), on 3 days rest in the World Series. It has been done 4 times. They combine for a 3-1 record, 3 complete games, 2 complete game shutouts and a 2.90 ERA. If you look at the relevant stats, not the ones that are convienient for the Yankee haters, then you realize that Pettitte realy has the advantage going on 3 days rest. I don’t know how much these stats can tell us, but if the critics claim their stats will predict something, then I’ll claim mine will to, and these stats give Pettitte the advantage. Series resumes Wednesday in New York with Yanks up 3-2. The Yankees and Phillies are back in New York and will take their workouts today at the Stadium. As if the Yankee loss in game 5 wouldn’t cause enough uproar among Yankee fans, there is also the Burnett debate smeared over it. Girardi has made some questionable moves at times, but seriously, in any baseball game, who would you rather have on the mound, Burnett or Gaudin? There was no way that Girardi was going to tell this huge offseason investment to miss out on the clinching game. Burnett going on short rest also sets up Pettitte — with the most postseason wins of all time — to pitch the clinching game in New York against Pedro Martinez. That situation doesn’t sound to bad to me. Not to mention you have CC to fall back on in game 7, just like the ALCS. Pettitte on short rest has a 4.15 ERA in his career and hasn’t done it since he was an Astro in 2006. Forget the numbers, Pettitte has pitched in the postseason more than any other pitcher in the history of the game, I don’t think we have to worry about anything. For those of you playing flashbacks of 2004 over and over in your head, let me calm you down. The Yankees led the league with a .704 winning percentage at home. They outscored opponents by 101 runs and hit 136 homers in their new park. And another thing, for all of the chaos and commotion taking place in New York over this game 5 loss, let me tell you something. The Yankees went into the defending champions home and beat them 2 out of 3. The only pitcher they have lost to is the Phillies best and the Yankees have a chance to clinch in their new home with the most experienced pitcher in the world on the mound. What are you complaining about?